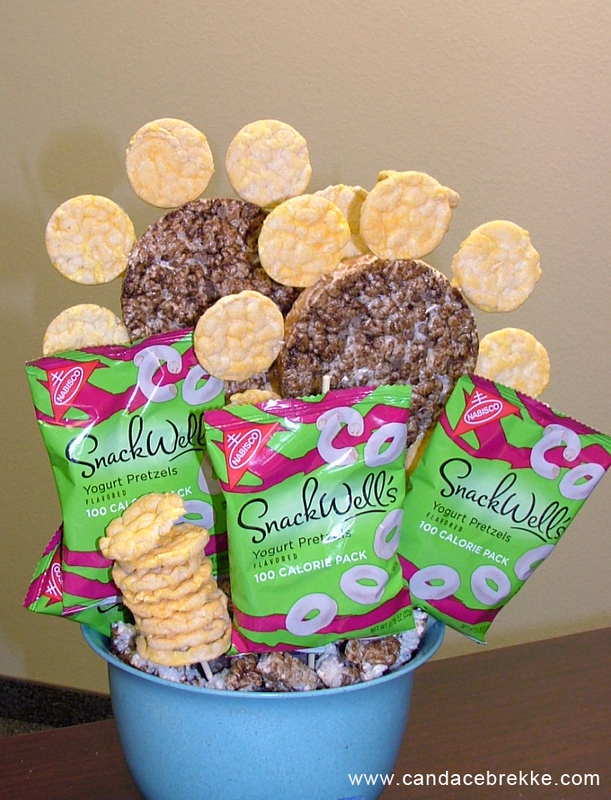 What a better way to make someone's day than with a rice cake bouquet? Ok, so it's kind of an inside joke, but we thought this was a great (and healthy) way to say farewell to our friend and co-worker who is moving on to a new adventure. I had a vision in my head when we first started to make sunflowers out of the rice cakes. At first I was going to 'paste' them together with peanut butter, but then decided to use toothpicks instead. I thought it would be less messy. Turns out, making a rice cake flower is still quite messy, so if you attempt your own, watch for sticky fingers and trails of powdered cheese! Simply attach the small cakes with a toothpick and then insert one large bbq wooden skewer as the stake. We used a stack of the large rice cakes as the base inside the pot. Some of the chocolate rice cakes were crumbled as the 'dirt' in the pot. Lastly, we filled some space (because we ran out of toothpicks to make more flowers!) with the green bags of snack packs to add color and act as the 'greenery' of the bouquet! Simple and healthy and adorable! And we thought it was pretty unique, too!